Made from chunky tinsel yarn. Tinsel does not fall apart like if you were to tie some tree tinsel into your hair. Comes in 42 different colours! The yarn is crocheted around a thick bobble and looks very full. Price is for one scrunchie. Add to basket or click on your preferred link to be redirected to a partner site. Problem with one of the links? Please let us know. 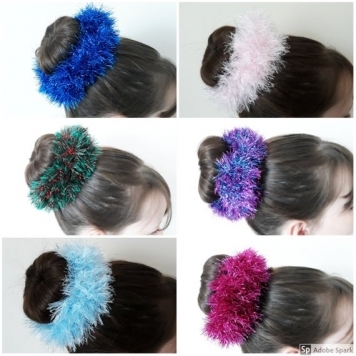 How Christmassy are these hair scrunchies! Made from tinsel yarn these would look super cute in anyone’s hair this Christmas and best of all the tinsel does not fall apart like if you were to tie some tree tinsel into your hair. They would also look great for young girls to wear to a party or their school Christmas disco. The yarn is chunky and comes in so many different colours (42!) there is enough to suit everyone’s style, just take a look at the last picture and match your choice from the drop down menu. Our aim is to help gymnasts, parents and coaches locate the best equipment and clothing at the lowest prices. We have scoured the world of gymnastics for the best products from reputable merchants and only list those which come highly recommended specifically for gymnasts. Disclosure: We are a professional shop site and we may receive a commission, at no additional cost to you, if you click on a link on Mr Gymnastic and make a purchase. Affiliate programmes and affiliations include, but are not limited to, the eBay Partner Network. Get Mr Gymnastic articles, news and offers in your inbox. We’d love to hear from you, please drop us a line! Trampolines – the Gift for Gymnasts that Keeps on Giving!